Do you love your phone emojis? We do too! Can’t get enough of them? Neither can we. Emoji’s are not just for texting anymore. They are taking over the apparel industry with catchy sayings on trendy products. At Customized Girl, we jumped on the opportunity to bring you a gallery full of emoji designs that are ready for you to customize. We’ve already provided emoji shirts and accessories that are amazing designs on their own but take the next step by adding your own unique touch by adding your own art and text. Decorating our apparel and accessories with these cute emoticons will let everyone know how hip and trendy you are. Our new emoji art is great for teens and even better as gifts. Nothing says I love you more than a smiley face blowing kisses and winking! Love that crop tank in the image above? 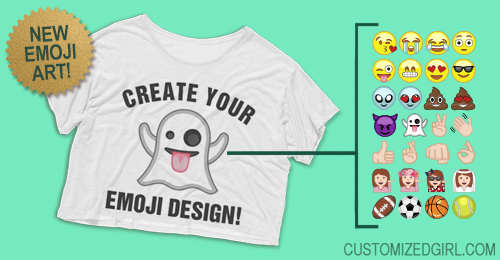 Want to use our design center to add anything you want (including emoji art) to some blank cropped shirts and tanks? Then check out all of our custom crop tops at Customized Girl and send us your amazing pictures with your custom emoji apparel!